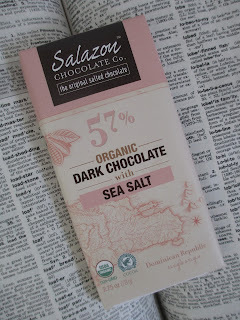 It took me just over a year to try something else from Salazon Chocolate Co., even though I had favorable comments for their Gingerbread bar last Christmas. Unintentionally, I came back this time with the non-gingerbread version of that same bar. That is, the 57% cocoa Dark Chocolate with Sea Salt. So the same deal as before: organic/non-GMO, Rainforest Alliance Certified, fairly traded. The same Dominican Republic sourced cocoa. The question is, will I still like this chocolate without the winter spices? The packaging is less cluttered than it was for the holiday bar. There are still a lot of elements, but they have a simpler look since they're mostly all in the same shade of pink. My only problem with the pink is that it's almost the exact shade of Himalayan salt: at first glance, this bar looks like it's salted with Himalayan salt. The label, of course, clearly says sea salt--but I would like more cohesion with the coloring. Once again, the chocolate bar is beautifully molded with an image of Central America and the top of South America. There is no border this time, which is a small change that does improve on an already good design. Here is where I start to have something of an issue. Last time, I also reviewed a chocolate bar with salt. And I gave Seed and Bean's Cornish Sea Salt positive comments. So maybe I was coming to this bar expecting a similar experience, which I didn't get--and I'm rather wishing that it had been more similar. There isn't much salt in this chocolate. I'm aware that, as I mentioned in my review of them last year, Salazon likes to keep the salt to a minimum and use it as a seasoning, the way that salt is used in food. I praised them for this last time: some companies do use too much salt for their salted chocolate. But last time, in addition to the chocolate flavors, there were all of those gingerbread spices--and so it made sense to keep the salt to a minimum. This time, it's just chocolate and salt, and so the salt is able to have more of a presence. I wanted more salt. The salt isn't within the chocolate; it's sprinkled on the back of the bar. So it's usually don't to hit your mouth first, but if you're letting the chocolate melt instead of chewing quickly through it, then the salt will fade long before the chocolate is gone. And when I'm eating chocolate from a company that specializes in salted chocolate, I don't want to forget straight away that the chocolate is salted. It's possible I'm being harsh here; as I said, it's a personal preference. Some people will probably appreciate that this chocolate is dark without getting in too deep. Some people will like that touch toward sweetness. And I don't mind it. The chocolate tastes fine, certainly better than what I'm going to call "grocery store chocolate" and I've already eaten through a whole row of it while I complain. It has kind of a dessert chocolate taste, like cold cream and chocolate chips. That's not very memorable, though. In fact, it was because I wasn't overly interested in the chocolate that I wanted more salt so that I would have something more interesting to taste. So this bar really didn't work for me, and I'm at a loss with how to conclude. Maybe the issue I'm having is visible right away in the label: 57% organic dark chocolate with sea salt. The type of people who care about how their chocolate is made and where it's sourced from are generally going to be comfortable with a more standard 70% range. The 50% range is usually for cheaper chocolate, flavored chocolate, or truffles and such--am I right? So I'm just confused about who this chocolate bar is. If it's so refined as to keep salt at the correct minimum amount, then why isn't it refined enough to avoid the awkward 50% cocoa range except when that angle makes sense, as with the Gingerbread chocolate?